The American says the only way the Irish fighter is similar to Ronda Rousey is that both have blonde hair. Conor McGregor has climbed into the top 10 of UFC rankings. COLE MILLER’S HAND injury kept him out of Conor McGregor triumphant UFC homecoming in Dublin last weekend but it has not precluded him from flapping his gums about the Irish featherweight. Miller was a guest of Beatdown on Sherdog Radio Network this week and while he complimented McGregor’s technique, he was quick to share his belief that the Irishman has been hyped up far too much. Miller remains outside the featherweight division’s top 15 after missing the McGregor bout [he was replaced by Diego Brandao] but feels the Dublin fighter does not warrant his top 10 placing or his September bout with sixth-ranked Dustin Poirier in Las Vegas. Miller stressed that the hometown factor that spurred McGregor, and his four SBG teammates, on in Dublin will be lacking in Las Vegas when he faces Poirier, a fighter who is ‘doing some real impressive things in the division’. Meanwhile, Setanta Sports announced, this afternoon, that McGregor’s 27 September fight at the MGM Grand will be screened live on BT Sport. McGregor v Poirier is on the undercard of Jon ‘Bones’ Jones v Alexander Gustafsson. You can listen to the full Beatdown show here. 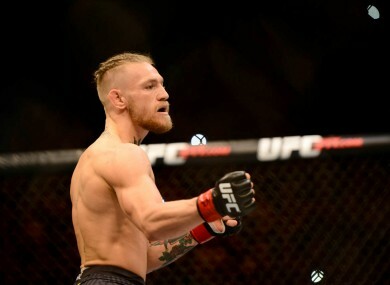 Email “Conor McGregor does not 'deserve a lot of things he's gotten', taunts Cole Miller ”. Feedback on “Conor McGregor does not 'deserve a lot of things he's gotten', taunts Cole Miller ”.